New Delhi, February 7: “Our friends in the Congress see things in two time periods. BC, which is Before Congress, when nothing happened, and the other is AD, After Dynasty where everything happened. A government has to work for the people of India. A Government has to be sensitive to people's aspirations”, attacked Prime Minister Narendra Modi in the lower house today addressing the Budget session. He thanked the President for acknowledging the reign’s efforts as the head of the government. "There has been criticism, there were baseless claims. But I think, since this is an election year, people are compelled to say something. There will be many critics but there are few who pledge to bring about a change. We are not those who run away from challenges. We face the challenges and are working with all our strength to fulfill people's demands”, he alleged further. Participating in the debate in Lok Sabha on the Motion of Thanks to the President's address, Congress member Mallikarjun Kharge had launched a sharp attack on Modi, accusing him of being arrogant, not consulting Cabinet colleagues on key decisions and alleging he cannot see the good works of past Congress governments because of hatred. 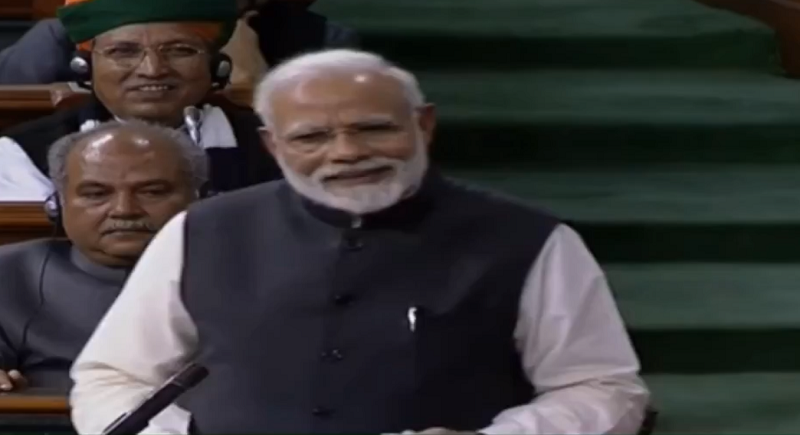 It is one thing to make a speech and thump the desk to laud it and another to save the country and democracy, he said, referring to Modi, who was present in the House. "In all spheres of economy, investment, steel sector, start ups, milk and agriculture, aviation, India's progress is outstanding. In 55 years, 12 crore gas connection were given. It is just in last 55 months that 13 crore gas connections were given and 6 crore were Ujjwala. The speed of the work done and for whom the work was done, you decide for yourself," reverted PM Modi. "You are allowed to criticise Modi. You are also free to criticise BJP. But in doing that, many people start criticising India. That is why Congress leaders go to London and do press conferences to show India in bad light", he added attacking further. Stressing at the Rafale deal, PM Narendra Modi continued to say that, Nirmala Sithraman answered each allegation made by the Congress over this issue. Congress does not want our country's air force to be strengthened. “Which company are you bidding for by fighting on Rafale deal? I want to say it on the floor of the Parliament that the Indian National Congress does not want our armed forces to be strong. They do not want our security apparatus to be strong. On Rafale, I wondered how these lie with confidence. They have accepted the fact that in the last 55 years, no big deal has been signed without a middleman”, he slammed. India is seeing remarkable progress in the last four years. The Congress has blamed their defeat in elections on EVMs. It has called planning commission a bunch of jokers. You dismissed elected governments. Indira Gandhi did this over 50 times. She dismissed elected governments. Before raising a finger at Modi, you should know that rest of the four fingers are pointing at you. Do you know what is my crime for Congress? That a person born to a poor family is challenging their Sultunate, Modi strongly acclaimed. In all three manifestos, Congress said within 3 years, every household will have electricity. I am worried that Congress keeps saying Gareebi Hatao. However, in all three manifestos, they made the same promise but the work is being done by me now. The phone banking of the UPA did wonders for the friends of their leaders. Due to such favouritism, our banking system witnessed many problems, he added further. When the commonwealth games were held, it was an opportunity for us to highlight the glory of our nation. But Congress was rather focussed on increasing their own wealth.